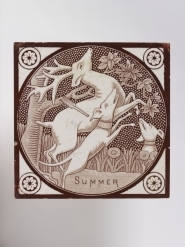 An earthenware tile transfer-printed in sepia. The pattern depicts Winter inside a roundel with two dogs before a log fire. In the background is a mounted stag's head. Inscribed with 'WINTER' below. Unmarked but probably made in England. Probably from a set of the seasons, similar designs depicting 'NIGHT' and 'DAY' are also known. Reference for similar example 'NIGHT' - Lockett, T. Collecting Victorian Tiles, 1979, p.130, fig 4.